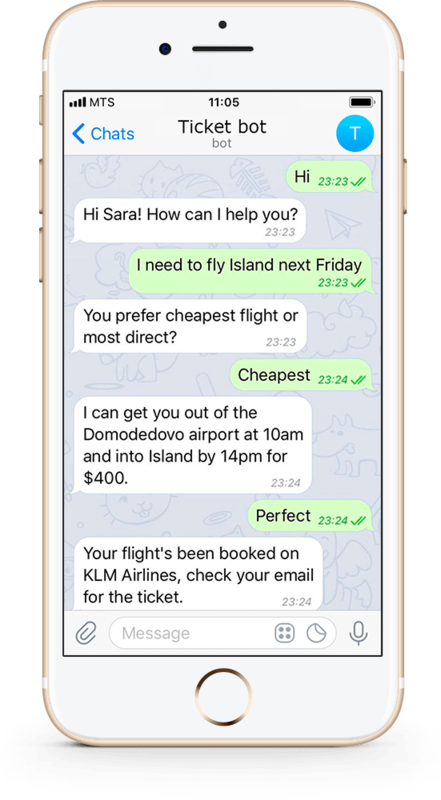 What are the benefits of using a chatbot? The chatbot can segment the incoming inquiries and use a specialized knowledge database to respond to single-type repeating questions. It can help the user to get access to the required information instantaneously thus avoiding the necessity to make a full-cycle phone call to the contact center. The chatbot computerizes client support processes and engages a human consultant only when it cannot handle an inquiry itself. Feel free to compare the cost of a chatbot inquiry processing to that of a company’s expert’s and you will be pleasantly surprised! Employing a chatbot will significantly decrease the client support costs. The chatbot has a potential of becoming essential to online stores. It is capable of picking out items in a dialog mode, share the information on specific selling points and prompt the client to the shopping cart or connect them to an operator. The trained chatbot encourages the clients to making informed decisions, follows them to the necessary webpages and shares special offers and important news. The chatbot can effectively use collected data from the user’s profile and the contact history during its interactions. Such personalized communication increases the interaction’s efficiency and strengthens emotional loyalty. Add the round-the-clock availability, intelligent and polite speaking manner, channeling the corporate core values, and there you have a perfect employee! Simple chatbot integration into popular messengers, social networks, and online chats, Facebook, Telegram, Viber, Skype, Skype for business, Kick, etc. Please fill out the form below and our experts will be in touch with you shortly.